So hows the bike made? 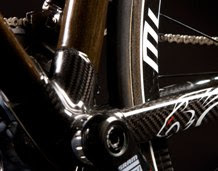 "The tubes on the MF-1 either 40% to 50% Flax or 100% 3K Carbon HM and are connected with the use of lugs this isn't the smoothest way, but it gives a very strong bond between the tubes and give great stiffness to the frame. The top tube slopes slightly from head to seat, not too much, but enough to help handling and stiffness. The head tube is bulky which keeps the frame stiff and cuts down on torsion stress, the seat stays are of a wishbone design and the seat tube has an aero profile. The MF-1 is strong and light, everything you need from a bike frame, it's not cheap, but a frame of this quality is never going to be a give away." Another review from Cycling weekly can be found here, and it talks about the bike, components, wheels and ride quality. 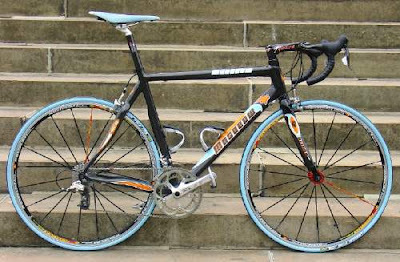 So the frame is a bunch of tubes combining both carbon with fiber, produced by a patented high temperature and pressure process, and these tubes are bonded to form a frame using a special purpose glue. The same patented process seems to be used in cigarette papers for improved ash characteristics! While the promised properties of the bicycle have to be really quantified and compared to existing designs to get a feel for its advantages, I look at the bike and say, 'That's one badass!' The colors are great and Museeuw is really looking to do things a little different. Thats great for the industry. If this is a viable solution, we'll see others jump into the equation and start using fibers for frames. Whether he'll be successful in making people believe in it is another question. Currently, these frames (MF-1) are about 5600 dollars (2900 pounds or do) a piece (just the frame!). This itself discourages the widespread use of something "green". “A 100 per cent carbon bike doesn’t absorb the shock and vibration inherent in top level bikes. The less vibration you can deliver – thanks to the combination of carbon with flax – means greater comfort for the rider." 2. IF Design Awards ? Many websites claim that the design sweeped the top prize in the IF Product Design Award for 2008 in the Product Design/Leisure Category, beating 3000 entries from 35 countries, I have not noticed any such awards for the bicycle in the IF website. I may be wrong but if one of you want to check and correct me by clicking on the previous link, go ahead. This bike and company were at the JEC composite show in Paris last April. While I think the concept is interesting, I see no advantage to flax over carbon fiber. There are many many things that can be incorporated into an epoxy matrix and considered "fiber". However, none have really proven to have an advantage over carbon for lightweight and high strength applications. If I lived in the flax growing region of Europe, I a may consider this frame. But I have no ties to flax and will opt for carbon which is lighter, stronger and less expensive. Cool , I've not heard of such a composite show but I figure they must show all kinds of sports products and such.. I hope the EFBe gets hold on one of these and pounds it with some loads to see how it performs. Chris, I found 1 or 2 JEC composite videos on youtube. Apparently, they're quite active in the F1 racing industry. Thanks!